CHAPTER XXIII CREST CORONETS AND CHAPEAUX THE present official rules are that crests must be upon, or must issue from, a wreath (or torse), a coronet, or a chapeau. It is not at the pleasure of the wearer to choose which he will, one or other being specified and included in the terms of the grant. If the crest have a lawful existence, one or other of them will unchangeably belong to the crest, of which it now is considered to be an integral part. In Scotland and Ireland, Lyon King of Arms and Ulster King of Arms have always been considered to have, and still retain, the right to grant crests upon a chapeau or issuing from a crest. But the power is (very properly) exceedingly sparingly used; and, except in the cases of arms and crests matriculated in Lyon Register as of ancient origin and in use before 1672, or "confirmed" on the strength of user by Ulster King of Arms, the ordinary ducal crest coronet and the chapeau are not now considered proper to be granted in ordinary cases. Since about the beginning of the nineteenth century the rules which follow have been very definite, and have been very rigidly adhered to in the English College of Arms. Crests issuing from the ordinary "ducal crest coronet" are not now granted under any circumstances. The chapeau is only granted in the case of a grant of arms to a peer, a mural coronet is only granted to officers in the army of the rank of general or above, and the naval coronet is only granted to officers in his Majesty's Royal Navy of the rank of admiral and above. An Eastern coronet is now only granted in the case of those of high position in one or other of the Imperial Services, who have served in India and the East. 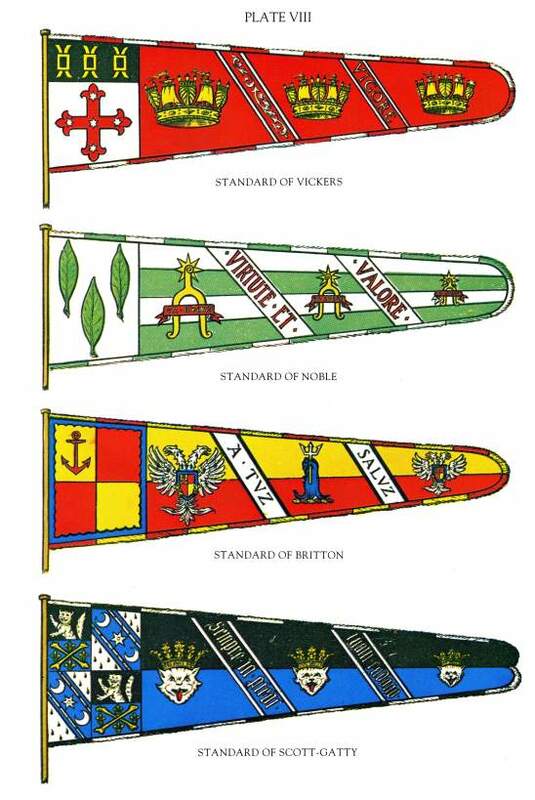 The granting of crests issuing from the other forms of crest coronets, the "crown-vallary" and the "crown palisado," is always discouraged, but no rule exists denying them to applicants, and they are to be obtained if the expectant grantee is sufficiently patient, importunate, and pertinacious. Neither form is, however, particularly ornamental, and both are of modern origin. There is still yet another coronet, the "celestial coronet." This is not unusual as a charge, but as a coronet from which a crest issues I know of no instance, nor am I aware of what rules, if any, govern the granting of it. Definite rank coronets have been in times past granted for use as crest coronets, but this practice, the propriety of which cannot be considered as other than highly questionable, has only been pursued, even in the more lax days which are past, on rare and very exceptional occasions, and has long since been definitely abandoned as improper. In considering the question of crest coronets, the presumption that they originated from coronets of rank at once jumps to the mind. This is by no means a foregone conclusion. It is difficult to say what is the earliest instance of the use of a coronet in this country as a coronet of rank. When it is remembered that the coronet of a baron had no existence whatever until it was called into being by a warrant of Charles II. after the Restoration, and that differentiated coronets for the several ranks in the Peerage are not greatly anterior in date, the question becomes distinctly complicated. From certainly the reign of Edward the Confessor the kings of England had worn crowns, and the great territorial earls, who it must be remembered occupied a position akin to that of a petty sovereign (far beyond the mere high dignity of a great noble at the present day), from an early period wore crowns or coronets not greatly differing in appearance from the crown of the king. But the Peerage as such certainly neither had nor claimed the technical right to a coronet as a mark of their rank, in the thirteenth and fourteenth centuries. But coronets of a kind were used, as can be seen from early effigies, long before the use of crests became general. But these coronets were merely in the nature of a species of decoration for the helmet, many of them far more closely resembling a jewelled torse than a coronet. Parker in his "Glossary of Terms used in Heraldry" probably correctly represents the case when he states: "From the reign of Edward III. coronets of various forms were worn (as it seems indiscriminately) by princes, dukes, earls, and even knights, but apparently rather by way of ornament than distinction, or if for distinction, only (like the collar of SS) as a mark of gentility. The helmet of Edward the Black Prince, upon his effigy at Canterbury, is surrounded with a coronet totally different from that subsequently assigned to his rank." The instance quoted by Parker might be amplified by countless others, but it may here with advantage be pointed out that the great helmet (or, as this probably is, the ceremonial representation of it) suspended above the Prince's tomb (Fig. 271) has no coronet, and the crest is upon a chapeau. Of the fourteen instances in the Plantagenet Garter plates in which the torse appears, twelve were peers of England, one was a foreign count, and one only a commoner. On the other hand, of twenty-nine whose Garter plates show crests issuing from coronets, four are foreigners, seven are commoners, and eighteen were peers. The coronets show very great variations in form and design, but such variations appear quite capricious, and to carry no meaning, nor does it seem probable that a coronet of gules or of azure, of which there are ten, could represent a coronet of rank. The Garter plate of Sir William De la Pole, Earl of (afterwards Duke of) Suffolk, shows his crest upon a narrow black fillet. Consequently, whatever may be the conclusion as to the wearing of coronets alone, it would seem to be a very certain conclusion that the heraldic crest coronet bore no relation to any coronet of rank or to the right to wear one. Its adoption must have been in the original instance, and probably even in subsequent generations, a matter of pure fancy and inclination. This is borne out by the fact that whilst the Garter plate of Sir Henry Bourchier, Earl of Essex, shows his crest upon a torse, his effigy represents it issuing from a coronet. Until the reign of Henry VIII., the Royal crest, both in the case of the sovereign and all the other members of the Royal Family, is always represented upon a chapeau or cap of dignity. The Great Seal of Edward VI. shows the crest upon a coronet, though the present form of crown and crest were originated by Queen Elizabeth. In depicting the Royal Arms, it is usual to omit one of the crowns, and this is always done in the official warrants controlling the arms. One crown is placed upon the helmet, and upon this crown is placed the crest, but theoretically the Royal achievement has two crowns, inasmuch as one of the crowns is an inseparable part of the crest. Probably the finest representation of the Royal crest which has ever been done is the design for one of the smaller bookplates for the Windsor Castle Library. This was executed by Mr. Eve, and it would be impossible to imagine anything finer. Like the rest of the Royal achievement, the Royal crest is of course not hereditary, and consequently it is assigned by a separate Royal Warrant to each male member of the Royal Family, and the opportunity is then taken to substitute for the Royal crown, which is a part of the sovereign's crest, a coronet identical with whatever may be assigned in that particular instance as the coronet of rank. In the case of Royal bastards the crest has always been assigned upon a chapeau. The only case which comes to one's mind in which the Royal crown has (outside the sovereign) been allowed as a crest coronet is the case of the town of Eye. The Royal crown of Scotland is the crest coronet of the sovereign's crest for the kingdom of Scotland. This crest, together with the crest of Ireland, is never assigned to any member of the Royal Family except the sovereign. The crest of Ireland (which is on a wreath or and azure) is by the way confirmatory evidence that the crowns in the crests of Scotland and England have a duplicate and separate existence apart from the crown denoting the sovereignty of the realm. The ordinary crest coronet or, as it is usually termed in British heraldry, the "ducal coronet" (Ulster, however, describes it officially as "a ducal crest coronet"), is quite a separate matter from a duke's coronet of rank. Whilst the coronet of a duke has upon the rim five strawberry leaves visible when depicted, a ducal coronet has only three. The "ducal coronet" (Fig. 656) is the conventional "regularised" development of the crest coronets employed in early times. Unfortunately it has in many instances been depicted of a much greater and very unnecessary width, the result being inartistic and allowing unnecessary space between the leaves, and at the same time leaving the crest and coronet with little circumferential relation. It should be noted that it is quite incorrect for the rim of the coronet to be jewelled in colour though the outline of jewelling is indicated. Though ducal crest coronets are no longer granted (of course they are still exemplified and their use permitted where they have been previously granted), they are of very frequent occurrence in older grants and confirmations. It is quite incorrect to depict a cap (as in a coronet of rank) in a crest coronet, which is never more than the metal circlet, and consequently it is equally incorrect to add the band of ermine below it which will sometimes be seen. The coronet of a duke has in one or two isolated cases been granted as a crest coronet. In such a case it is not described as aduke's coronet, but as a "ducal coronet of five leaves." It so occurs in the case of Ormsby-Hamilton. The colour of the crest coronet must be stated in the blazon. Crest coronets are of all colours, and will be sometimes found bearing charges upon the rim (particularly in the cases of mural and naval coronets). An instance of this will be seen in the case of Sir John W.
Moore, and of Mansergh, the label in this latter case being an unalterable charge and not the difference mark of an eldest son. Though the tincture of the coronet ought to appear in the blazon, nevertheless it is always a fair presumption (when it is not specified) that it is of gold, coronets of colours being very much less frequently met with. On this point it is interesting to note that in some of the cases where the crest coronet is figured upon an early Garter plate as of colour, it is now borne gold by the present descendants of the family. For example on the Garter plate of Sir Walter Hungerford, Lord Hungerford, the crest ["A garb or, between two silver sickles "] issues from a coronet azure. The various Hungerford families now bear it "or." The crest upon the Garter plate of Sir Humphrey Stafford, Duke of Buckingham ["A demi-swan argent, beaked gules "], issues from a coronet gules. This crest as it is now borne by the present Lord Stafford is: "Out of a ducal coronet per pale gules and sable," &c.
*1 Out of a ducal coronet gules, a lion's head ermine (Nicholson). Probably, however, the most curious instance of all will be found in the case of a crest coronet of ermine, of which an example occurs in the Gelre "Armorial." A very general misconception--which will be found stated in practically every text-book of armory--is that when a crest issues from a coronet the wreath must be omitted. There is not and never has been any such rule. The rule is rather to the contrary. Instances where both occur are certainly now uncommon, and the presence of a wreath is not in present-day practice considered to be essential if a coronet occurs, but the use or absence of a wreath when the crest issues from a coronet really depends entirely upon the original grant. If no wreath is specified with the coronet, none will be used or needed, but if both are granted both should be used. An instance of the use of both will be found on the Garter Stall plate of Sir Walter Devereux, Lord Ferrers. The crest (a talbot's head silver) issues from a coronet or, which is placed upon a torse argent and sable. Another instance will be found in the case of the grant of the crest of Hanbury. A quite recent case was the grant by Sir Bernard Burke, Ulster King of Arms, of a crest to Sir Richard Quain, Bart., the blazon of which was: "On a wreath argent and azure, and out of a mural coronet proper a demi-lion rampant or, charged on the shoulder with a trefoil slipped vert, and holding between the paws a battle-axe also proper, the blade gold." Other instances are the crests of Hamilton of Sunningdale and Tarleton. Another instance will be found in the grant to Ross-of-Bladensburg. Possibly this blazon may be a clerical error in the engrossment, because it will be noticed that the wreath does not appear in the emblazonment(Plate II.). I wonder how many of the officers of arms are aware of the existence of a warrant, dated in 1682, issued by the Deputy Earl-Marshal to the Companies of Painters, Stainers, and Coachmakers, forbidding them to paint crests which issue out of ducal coronets without putting them upon "wreaths of their colours." The wording of the warrant very plainly shows that at that date a wreath was always painted below a crest coronet. The warrant, however, is not so worded that it can be accepted as determining the point for the future, or that it would override a subsequent grant of a crest in contrary form. But it is evidence of what the law then was. No crest is now granted without either wreath, coronet, or chapeau. *1 Crest of Bentinck: Out of a marquess's coronet proper, two arms counter-embowed, vested gules, on the hands gloves or, and in each hand an ostrich feather argent. There are some number of instances of the use of an earl's coronet as a crest coronet. 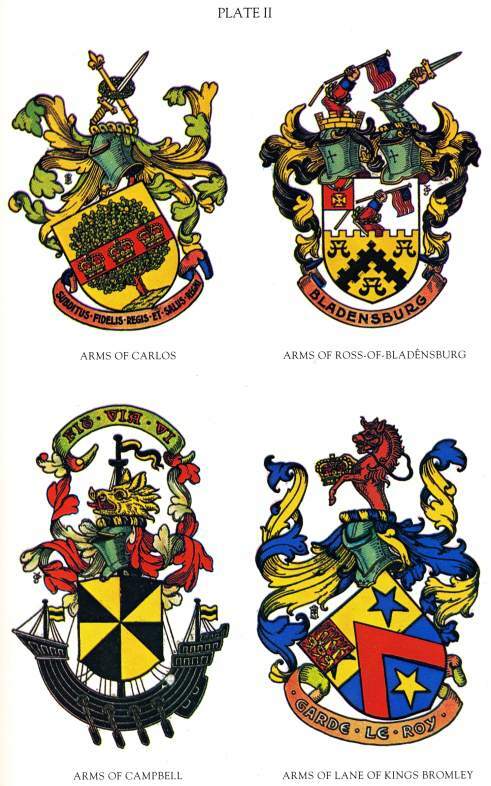 Amongst these may be mentioned the crests of Sir Alan Seton Steuart, Bart. ["Out of an earl's coronet a dexter hand grasping a thistle all proper"], that granted to Cassan of Sheffield House, Ireland [" Issuant from an earl's coronet proper, a boar's head and neck erased or, langued gules"], James Christopher Fitzgerald Kenney, Esq., Dublin [" Out of an earl's coronet or, the pearls argent, a cubit arm erect vested gules, cuffed also argent, the hand grasping a roll of parchment proper"], and Davidson ["Out of an earl's coronet or, a dove rising argent, holding in the beak a wheat-stalk bladed and eared all proper "]. I know of no crest which issues from the coronet of a viscount, but a baron's coronet occurs in the case of Forbes of Pitsligo and the cadets of that branch of the family: "Issuing out of a baron's coronet a dexter hand holding a scimitar all proper." Foreign coronets of rank have sometimes been granted as crest coronets in this country, as in the cases of the crests of Sir Francis George Manningham Boileau, Bart., Norfolk [" In a nest or, a pelican in her piety proper, charged on the breast with a saltire couped gules, the nest resting in a foreign coronet"], Henry Chamier, Esq., Dublin["Out of a French noble coronet proper, a cubit arm in bend vested azure, charged with five fleurs-de-lis in saltire or, cuffed ermine, holding in the hand a scroll, and thereon an open book proper, garnished gold"], John Francis Charles Fane De Salis, Count of the Holy Roman Empire [" i. Out of a marquis' coronet or, a demi-woman proper, crowned or, hair flowing down the back, winged in place of arms and from the armpits azure; 2. out of a ducal coronet or, an eagle displayed sable, ducally crowned also or; 3. out of a ducal coronet a demi-lion rampant double-queued and crowned with a like coronet all or, brandishing a sword proper, hilt and pommel of the first, the lion cottised by two tilting-spears of the same, from each a banner paly of six argent and gules, fringed also or"], and Mahony, Ireland ["Out of the coronet of a Count of France a dexter arm in armour embowed grasping in the hand a sword all proper, hilt and pommel or, the blade piercing a fleur-de-lis of the last "]. A curious crest coronet will be found with the Sackville crest. This is composed of fleurs-de-lis only, the blazon of the crest being: "Out of a coronet composed of eight fleurs-de-lis or, an estoile of eight points argent." A curious use of coronets in a crest will be found in the crest of Sir Archibald Dunbar, Bart. [" A dexter hand apaumée reaching at an astral crown proper "] and Sir Alexander James Dunbar, Bart. [" A dexter hand apaumée proper reaching to two earls' coronets tied together "]. Care should be taken to distinguish the mural crown from the "battlements of a tower." This originated as a modern "fakement" and is often granted to those who have been using a mural coronet, and desire to continue within its halo, but are not qualified to obtain in their own persons a grant of it. It should be noticed that the battlements of a tower must always be represented upon a wreath. Its facility for adding a noticeable distinction to a crest has, however, in these days, when it is becoming somewhat difficult to introduce differences in a stock pattern kind of crest, led to its very frequent use in grants during the last hundred years. Care should also be taken to distinguish between the "battlements of a tower" and a crest issuing from "a castle," as in the case of Harley; "a tower," as in that of Boyce; and upon the "capital of a column," as in the crests of Cowper-Essex and Pease. Abroad, e.g. in the arms of Paris, it is very usual to place a mural crown over the shield of a town, and some remarks upon the point will be found on page 368. This at first sight may seem an appropriate practice to pursue, and several heraldic artists have followed it and advocate it in this country. But the correctness of such a practice is, for British purposes, strongly and emphatically denied officially, and whilst we reserve this privilege for grants to certain army officers of high rank, it does not seem proper that it should be available for casual and haphazard assumption by a town or city. That being the case, it should be borne in mind that the practice is not permissible in British armory. The naval coronet (Fig. 658), though but seldom granted now, was very popular at one time. In the latter part of the eighteenth and the early part of the nineteenth centuries, naval actions were constantly being fought, and in a large number of cases where the action of the officer in command was worthy of high praise and reward, part of such reward was usually an augmentation of arms. Very frequently it is found that the crest of augmentation issued from a naval coronet. This is, as will be seen, a curious figure composed of the sail and stern of a ship repeated and alternating on the rim of a circlet. Sometimes it is entirely gold, but usually the sails are argent. 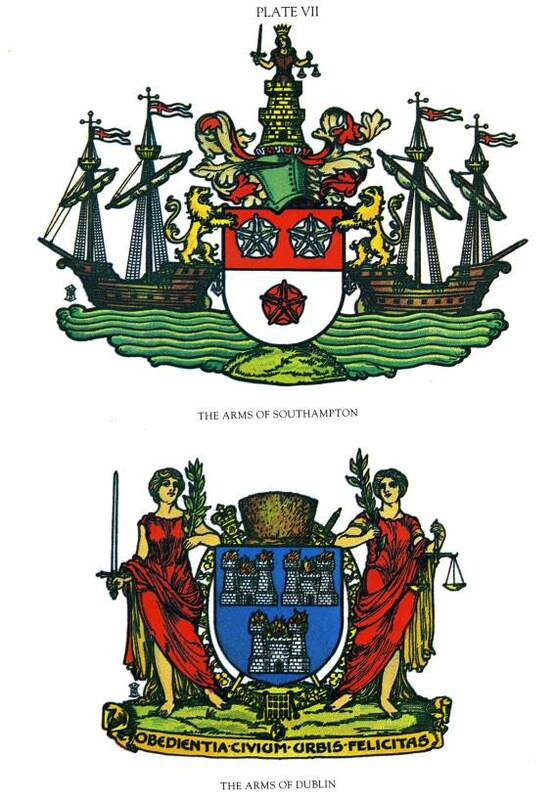 An instance of such a grant of augmentation will be found in the crest of augmentation for Brisbane and in a crest of augmentation granted to Sir Philip Bowes Broke to commemorate his glorious victory in the Shannon over the American ship Chesapeake. Any future naval grant of a crest of augmentation would probably mean, that it would be granted issuing out of a naval coronet, but otherwise the privilege is now confined to those grants of arms in which the patentee is of the rank of admiral. Instances of its use will be found in the crests of Schomberg and Farquhar, and in the crest of Dakyns of Derbyshire: "Out of a naval coronet or, a dexter arm embowed proper, holding in the hand a battle-axe argent, round the wrist a ribbon azure." The crest of Dakyns is chiefly memorable for the curious motto which accompanies it; "Strike, Dakyns, the devil's in the hempe," of which no one knows the explanation. Why a naval crown was recently granted as a badge to a family named Vickers (Plate VIII.) I am still wondering. The crest of Lord St. Vincent ["Out of a naval coronet or, encircled by a wreath of oak proper, a demi-pegasus argent, maned and hoofed of the first, winged azure, charged on the wing with a fleur-de-lis gold"] is worthy of notice owing to the encircling of the coronet, and in some number of cases the circlet of the coronet has been made use of to carry the name of a captured ship or of a naval engagement. The Eastern Coronet (Fig. 659) is a plain rim heightened with spikes. Formerly it was granted without restriction, but now, as has been already stated, it is reserved for those of high rank who have served in India or the East. An instance occurs, for example, in the crest of Rawlinson, Bart. [" Sable, three swords in pale proper, pommels and hilts or, two erect, points upwards, between them one, point downwards, on a chief embattled of the third an antique crown gules. Crest: out of an Eastern crown or, a cubit arm erect in armour, the hand grasping a sword in bend sinister, and the wrist encircled by a laurel wreath proper "]. Of identically the same shape is what is known as the "Antique Coronet." It has no particular meaning, and though no objection is made to granting it in Scotland and Ireland, it is not granted in England. Instances in which it occurs under such a description will be found in the cases of Lanigan O'Keefe and Matheson. The Crown Vallary or Vallary Coronet (Fig. 660) and the Palisado Coronet (Fig. 661) were undoubtedly originally the same, but now the two forms in which it has been depicted are considered to be different coronets. Each has the rim, but the vallary coronet is now heightened only by pieces of the shape of vair, whilst the palisado coronet is formed by high "palisadoes" affixed to the rim. These two are the only forms of coronet granted to ordinary and undistinguished applicants in England. The circlet from the crown of a king of arms has once at least been granted as a crest coronet, this being in the case of Rogers Harrison. In a recent grant of arms to Gee, the crest has no wreath, but issues from "a circlet or, charged with a fleur-de-lis gules." The circlet is emblazoned as a plain gold band. THE CHAPEAU Some number of crests will be found to have been granted to be borne upon a "chapeau" in lieu of wreath or coronet. Other names for the chapeau, under which it is equally well known, are the "cap of maintenance" or "cap of dignity." There can be very little doubt that the heraldic chapeau combines two distinct origins or earlier prototypes. The one is the real cap of dignity, and the other is the hat or "capelot" which covered the top of the helm before the mantling was introduced, but from which the lambrequin developed. The curious evolution of the chapeau from the "capelot," which is so marked and usual in Germany, is the tall conical hat, often surmounted by a tuft or larger plume of feathers, and usually employed in German heraldry as an opportunity for the repetition of the livery colours, or a part of, and often the whole design of, the arms. But it should at the same time be noticed that this tall, conical hat is much more closely allied to the real cap of maintenance than our present crest "chapeau." Exactly what purpose the real cap of maintenance served, or of what it was a symbol, remains to a certain extent a matter of mystery. The "Cap of Maintenance "--a part of the regalia borne before the sovereign at the State opening of Parliament (but not at a coronation) by the Marquesses of Winchester, the hereditary bearers of the cap of maintenance--bears, in its shape, no relation to the heraldic chapeau. The only similarity is its crimson colour and its lining of ermine. It is a tall, conical cap, and is carried on a short staff. FIG. 662.--The Crown of King Charles II. Whilst crest coronets in early days appear to have had little or no relation to titular rank, there is no doubt whatever that caps of dignity had. Long before, a coronet was assigned to the rank of baron in the reign of Charles II. ; all barons had their caps of dignity, of scarlet lined with white fur; and in the old pedigrees a scarlet cap with a gold tuft or tassel on top and a lining of fur will be found painted above the arms of a baron. This fact, the fact that until after Stuart days the chapeau does not appear to have been allowed or granted to others than peers, the fact that it is now reserved for the crests granted to peers, the fact that the velvet cap is a later addition both to the sovereign's crown and to the coronet of a peer, and finally the fact that the cap of maintenance is borne before the sovereign only in the precincts of Parliament, would seem to indubitably indicate that the cap of maintenance was inseparably connected with the lordship and overlordship of Parliament vested in peers and in the sovereign. In the crumpled and tasselled top of the velvet cap, and in the ermine border visible below the rim, the high conical form of the cap of maintenance proper can be still traced in the cap of a peer's coronet, and that the velvet cap contained in the crown of the sovereign and in the coronet of a peer is the survival of the old cap of dignity there can be no doubt. This is perhaps even more apparent in Fig. 662, which shows the crown of King Charles II., than in the representations of the Royal crown which we are more accustomed to see. The present form of a peer's coronet is undoubtedly the conjoining of two separate emblems of his rank. The cap of maintenance or dignity, however, as represented above the arms of a baron, as above referred to, was not of this high, conical shape. It was much flatter. The high, conical, original shape is, however, preserved in many of the early heraldic representations of the chapeau, as will be noticed from an examination of the ancient Garter plates or from a reference to Fig. 271, which shows the helmet with its chapeau-borne crest of Edward the Black Prince. Of the chapeaux upon which crests are represented in the early Garter plates the following facts may be observed. They are twenty in number of the eighty-six plates reproduced in Mr. St. John Hope's book. It should be noticed that until the end of the reign of Henry VIII. the Royal crest of the sovereign was always depicted upon a chapeau gules, lined with ermine. Of the twenty instances in which the chapeau appears, no less than twelve are representations of the Royal crest, borne by closely allied relatives of the sovereign, so that we have only eight examples from which to draw deductions. But of the twenty it should be pointed out that nineteen are peers, and the only remaining instance (Sir John Grey, K.G.) is that of the eldest son and heir apparent of a peer, both shield and crest being in this case boldly marked with the "label" of an eldest son. Consequently it is a safe deduction that whatever may have been the regulations and customs concerning the use of coronets, there can be no doubt that down to the end of the fifteenth century the use of a chapeau marked a crest as that of a peer. Of the eight non-Royal examples one has been repainted, and is valueless as a contemporary record. Of the remaining seven, four are of the conventional gules and ermine. One only has not the ermine lining, that being the crest of Lord Fanhope. It is plainly the Royal crest "differenced" (he being of Royal but illegitimate descent), and probably the argent in lieu of ermine lining is one of the intentional marks of distinction. The chapeau of Lord Beaumont is azure, semé-de-lis, lined ermine, and that of the Earl of Douglas is azure lined ermine, this being in each case in conformity With the mantling. Whilst the Beaumont family still use this curiously coloured chapeau with their crest, the Douglas crest is now borne (by the Duke of Hamilton) upon one of ordinary tinctures. Chapeaux, other than of gules lined ermine, are but rarely met with, and unless specifically blazoned to the contrary a cap of maintenance is always presumed to be gules and ermine. About the Stuart period the granting of crests upon chapeaux to others than peers became far from unusual, and the practice appears to have been frequently adopted prior to the beginning of the nineteenth century. Some of these crest chapeaux, however, were not of gules. An instance of this kind will be found in the grant in 1667 to Sir Thomas Davies, then one of the sheriffs of the City of London, but afterwards(in 1677) Lord Mayor. The crest granted was: "On a chapeau sable, turned up or, a demi-lion rampant of the last." The reason for the grant at that date of such a simple crest and the even more astonishingly simple coat of arms [" Or, a chevron between three mullets pierced sable "] has always been a mystery to me. The arms of Lord Lurgan (granted or confirmed 1840) afford another instance of a chapeau of unusual colour, his crest being: "Upon a chapeau azure turned up ermine, a greyhound statant gules, collared or." There are some number of cases in which peers whose ancestors originally bore their crests upon a wreath have subsequently placed them upon a chapeau. The Stanleys, Earls of Derby, are a case in point, as are also the Marquesses of Exeter. The latter case is curious, because although they have for long enough so depicted their crest, they only comparatively recently (within the last few years) obtained the necessary authorisation by the Crown. At the present time the official form of the chapeau is as in Fig. 663, with the turn up split at the back into two tails. No such form can be found in any early representation, and most heraldic artists have now reverted to an earlier type. Before leaving the subject of the cap of maintenance, reference should be made to another instance of a curious heraldic headgear often, but quite incorrectly, styled a "cap of maintenance." This is the fur cap invariably used over the shields of the cities of London, Dublin, and Norwich. There is no English official authority whatever for such an addition to the arms, but there does appear to be some little official recognition of it in Ulster's Office in the case of the city of Dublin. The late Ulster King of Arms, however, informed me that he would, in the case of Dublin, have no hesitation whatever in certifying the right of the city arms to be so displayed(Plate VII.). In the utter absence of anything in the nature of a precedent, it is quite unlikely that the practice will be sanctioned in England. The hat used is a flat-topped, brown fur hat of the shape depicted with the arms of the City of Dublin. It is merely(in London)a part of the official uniform or livery of the City sword-bearer. It does not even appear to have been a part of the costume of the Lord Mayor, and it must always remain a mystery why it was ever adopted for heraldic use. But then the chain of the Lord Mayor of London is generally called a Collar of SS. Besides this the City of London uses a Peer's helmet, a bogus modern crest, and even more modern bogus supporters, so a few other eccentricities need not in that particular instance cause surprise.